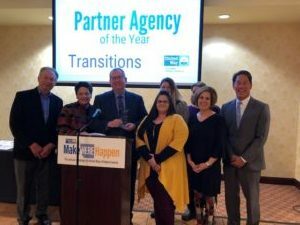 Transitions was named the United Way’s “Partner Agency of the Year” at the United Way Annual Meeting on February 27th. In making the award, the United Way thanked Transitions for “constantly offering their staff and support to [the United Way] campaign, solution teams, and volunteer events”. We thank the United Way for this recognition and for all that the United Way does in our community.